Intel announced a new product family for its 8th Generation Core family that combines a 35-watt processor and AMD Radeon graphics chip on a single package in order to create a new class of gaming notebook solution. It hasn’t been assigned a brand yet, that will likely occur with a formal announcement at CES this January. This announcement has significant impact because it solidifies a partnership between competitors AMD and Intel for a product in a space both compete in. The stated goal for this new product was to address the pains of the growing and profitable gaming notebook market. Traditionally, machines built for this segment are big, bulky, thick, and have poor battery life. This is in large part due to the combination of large, discrete chips for both the processor and graphics, forcing bigger circuit board designs and more cooling requirements. Kaby Lake-G, as it was called during development, will take a high performance H-series Intel processor, likely a quad-core solution similar to what Intel released for the desktop this fall, and put it on the same design as an AMD-built semi-custom graphics chip, along with second-generation HBM (high-bandwidth memory) for the graphics to utilize. We don’t have details on the chip that AMD has built, but we do know that this falls into the semi-custom category that AMD has used to build products for Microsoft’s Xbox and Sony’s PlayStation families. Unlike those designs, however, AMD is only supplying the graphics chip to Intel. It’s worth noting that both Intel and AMD are insistent that this is not a licensing deal of any kind – Intel is simply becoming a customer of AMD’s semi-custom division. 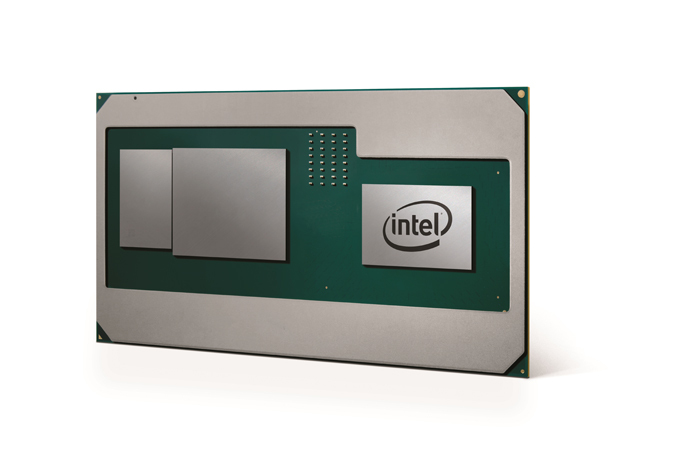 With this release Intel has a product with the ability to address the gaming notebook market without requiring OEMs to include other company’s hardware. Ironically, Intel did have to reach outside its own engineering walls to make it happen, but the new product is completely owned by Intel. This should spark innovation in the gaming notebook space, giving us thinner, lighter, and longer battery life options in 2018. For AMD, this is a big win. It expands the company’s portfolio on the semi-custom division with a customer that could potential sell millions of units. Intel is the largest chip provider for the notebook space, and though the gaming market is a small portion of that, new designs that offer thin-and-light options with gaming capability will grow it significantly. It also shows the value of AMD’s graphics IP, as even the company’s biggest rival was willing to utilize it for a new design. The only company that might see some negative fallout from this announcement is NVIDIA. It has long benefited from the lack of Intel graphics performance by offering discrete graphics solutions to notebook manufacturers to supplement gaming capability. With Intel now able to offer a product solution to HP, Dell, Lenovo, and others that provides equal levels of performance, tighter integration, and a single vendor relationship, the GeForce line could see a regression in the mainstream gaming notebook market. Though Intel and AMD aren’t talking about customers yet, you can bet that Apple will be the one of the first and probably the biggest buyer of these chips for 2018. Many Apple MacBooks already combine an Intel processor with AMD Radeon graphics, though in separate, discrete forms. This new Intel product will likely offer the same or better performance, lower power draw, and give Apple the ability to shrink the form factor and design of its hardware. I actually wouldn’t be surprised if Apple was the catalyst for this product; it could have left Intel for AMD’s Ryzen product family that combines performant CPU cores with Radeon graphics in some designs. By pushing Intel make this product, Apple can use it to create 13-in notebooks with discrete-level performance, use it for iMac hardware, and build MacBook Pro in a smaller design. Intel is using a new technology called EMIB (Embedded Multi-Die Interconnect Bridge) to combine the silicon. This allows chips from different process technologies and from different vendors to be packaged together and communicate over a very high-speed, low profile interface. This allows a chip to be built with the compute power of a much larger design, but with half of the physical footprint and a lower z-height (vertical height). This allows OEMs to build thinner and lighter gaming designs than were possible before, as well as adding capacity to extend battery life. This will likely spell the end of Intel’s development into its Iris Pro graphics, its attempt to build notebook-segment high performance graphics of its own. Apple is the only major customer still building and selling hardware using it, and this new Intel-AMD product would be an obvious replacement.